Follow the instructions below for Mac OS X Version 10.4, nicknamed "Tiger". 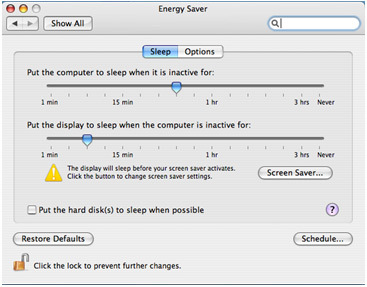 Steps for activating sleep settings in other versions of OS X will be very similar. Click on the apple symbol (Apple Menu) in the upper left of your screen. EPA recommends setting computers to enter system standby or hibernate after 15 to 60 minutes of inactivity. To save even more, set monitors (displays) to enter sleep mode after 5 to 20 minutes of inactivity. The lower the setting, the more energy you save. The "Put the hard disk(s) to sleep when possible" setting does not save much power, and can be ignored.